This is the second post in the series. If you missed the previous post introducing the large file in which comedian Phyllis Diller organized thousands of her jokes alphabetically by topic, you can find it here. Help us transcribe Diller's jokes with the Smithsonian Transcription Center. When I first learned that I would be digitizing all of the estimated 40,000 index cards in Phyllis Diller's gag file, I did not entirely know what to expect. I was excited to return to the National Museum of American History, where I had previously interned, but the prospect of spending day after day individually scanning 40,000 three-by-five index cards sounded less than exciting. Boy, was I wrong! Before I started the job, all I really knew about Phyllis Diller was that she was a comedian before my time. So I decided to read her autobiography, Like a Lampshade in a Whorehouse: My Life in Comedy. My journey to learn about Diller started off on a good foot when I discovered she grew up in Lima, Ohio, which is only a little more than an hour drive from where I grew up. The more I learned about my fellow Ohioan, the more I liked her. Not only did she break barriers in the comedy world to become one of the first female solo stand-up comic, she was also a classical pianist, author, Broadway actress, and accomplished painter. She lived to the age of 95 and left an incredible legacy after her half-century-long groundbreaking career. 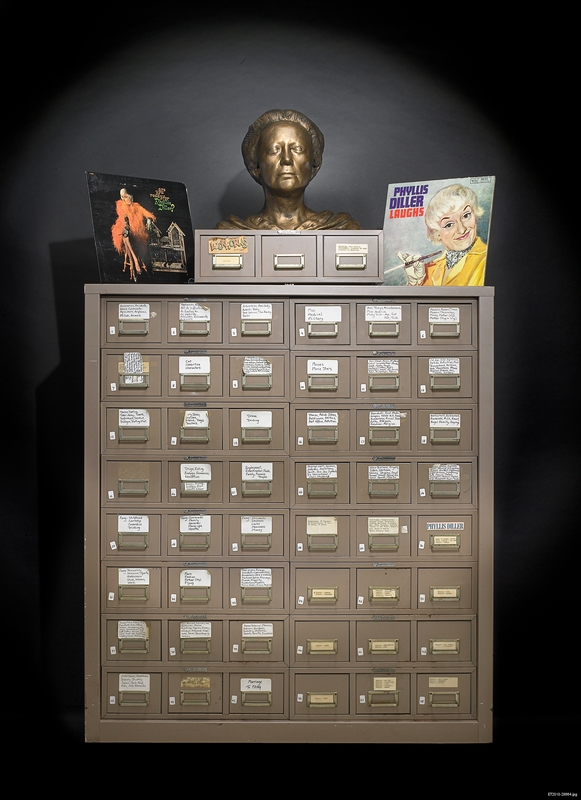 Phyllis Diller donated her joke file to the Smithsonian in 2003 along with costumes, props, scripts, awards, and sound recordings illustrating her impressive career. The gag file consists of a steel cabinet with 48 drawers, plus a three-drawer expansion, containing three-by-five index cards, each holding a typewritten joke or gag. These index cards are organized alphabetically by subject ranging from accessories to world affairs and covering almost everything in between. The gag file is a prized object in the museum's collection, and we're excited for the opportunity to catalog, photograph, and digitize it in more depth. I started my project by writing a small number, in pencil, on the back of each card. The numbers are used to keep track of the original drawer in which the card was located, as well as the card's position within that drawer. For example, the card numbered 15-0837 would be the 837th card in Drawer 15. Next, I scanned each card. Because the jokes were typed on sturdy notecards, I was able to use a sheet-fed scanner, which made the whole process a lot faster. But I soon discovered it was not going to be that simple. While most of the joke cards are simply index cards with a joke typed on, others are more complicated. Some cards have strips of paper glued to them with longer jokes on those papers. Some cards have entire letter-size sheets of paper containing long jokes stapled to the cards. Some cards have comic strips, cut from the newspaper, glued to the cards. Other cards are not even cards but are just pieces of printer paper with jokes scribbled on them. These irregular cards were not stable enough to be sent through the feed scanner and had to be scanned one-by-one using a flatbed scanner, which slowed my progress. Another surprise was the amount of notecards that are associated with one another. While some cards contain a short one-line joke, other jokes span several cards. These collections of cards had originally been paper-clipped together, but at some point in the life of the gag file the paper clips were removed. This removal was great in terms of preservation because paper clips tend to rust and cause damage to the surface to which they have been attached. But the removal also made it difficult to decipher which cards were originally associated with one another. I was able to use the bend marks on cards as well as rust marks from where a paper clip used to be to record which joke cards were most likely originally paper-clipped together. This association is important to note because some individual cards only hold a portion of a longer joke and therefore do not make sense independently. As I was numbering and scanning all of the joke cards in the gag file, I also got to read many of the jokes. When I tell people about my job, most respond with something along the lines of, "you must be laughing all day," but in reality that is not quite the case. Some of the cards only held parts of a joke in development, like "airplane," and other jokes did not land because I did not know the movie star or celebrity referenced. The main thing I learned while reading through Phyllis Diller's jokes is that comedy has changed a lot since she started her career in the mid-1950s. Her comedy is focused on short one-liners that get laughs in quick succession, while today's comedy is more story-driven. Although a lot of her jokes are very time-bound due to their content, it was interesting to get a glimpse of what was happening at the time a joke was written. Each joke card has a date on it, and the cards span the 1960s to the 1990s. The topic of the jokes told a lot about what people were worried about or focused on at the time the joke was written, whether it was the inflation or student protests of the 1970s, a celebrity's many marriages, or gossip about the president at the time. While, like any comedian, some of her jokes fall flat, I appreciated Diller's hard work in meticulously recording, testing, and filing each joke in the gag file, along with her ability to make a joke about almost any topic. In the end, I numbered and scanned 52,569 individual note cards from the Phyllis Diller gag file. While I might not be able to honestly say that she is my favorite comedian, I will gladly talk your ear off about all of the incredible things my fellow Ohioan accomplished. She was an amazing woman who I respect and appreciate for her career and the many doors she opened for other women along the way. Hanna BredenbeckCorp is a project assistant in the Division of Culture and the Arts. Visit the Smithsonian Transcription Center to help transcribe the jokes.